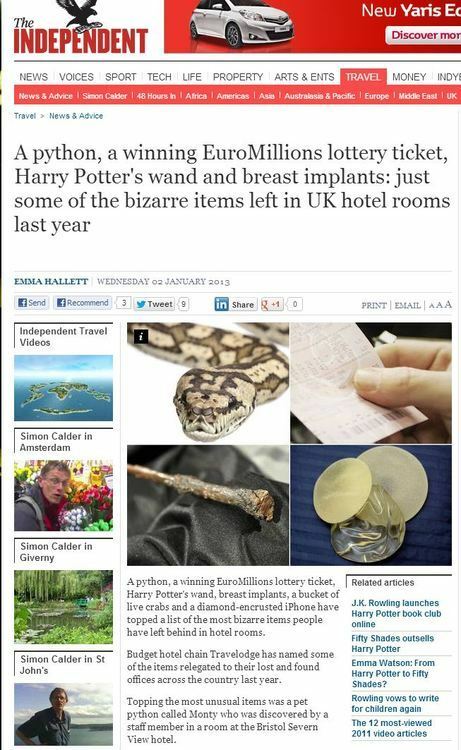 A python, a winning EuroMillions lottery ticket, Harry Potter’s wand, breast implants, a bucket of live crabs and a diamond-encrusted iPhone have topped a list of the most bizarre items people have left behind in hotel rooms. Budget hotel chain Travelodge has named some of the items relegated to their lost and found offices across the country last year. 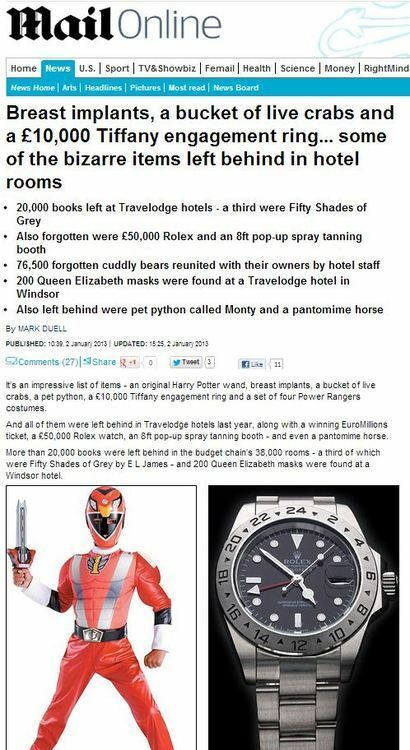 It’s an impressive list of items – an original Harry Potter wand, breast implants, a bucket of live crabs, a pet python, a £10,000 Tiffany engagement ring and a set of four Power Rangers costumes. And all of them were left behind in Travelodge hotels last year, along with a winning EuroMillions ticket, a £50,000 Rolex watch, an 8ft pop-up spray tanning booth – and even a pantomime horse. There are no prizes for being able to spot that this story is, in fact, a press release from the prolific PR department of Travelodge – the eye-catchingly varied nature of the items left behind proving perfect tabloid fodder. This entry was posted in Travelodge and tagged daily mail, Emma Hallett, independent, katy winter, mark duell, shakila ahmed, telegraph, travelodge on January 20, 2013 by Michael Marshall.